One can encourage creativity in a child by providing the right art materials and the work space at home. It will be better to set an art time for younger children which can help them develop the habit for scheduling themselves as they grow. The most important thing to remember is, not to constantly refrain them with 'don't make a mess or don't dirty your clothes' and so on. Children can use their existing comfortable tables and chairs. The table and the wall nearby can be covered with newspaper for extra protection. The best would be to identify a ' free to use' space in the room. Wearing old clothes (so they don't regret soiling their fav clothing) or aprons is ideal. A table top easel can also be purchased, it gives them that extra edge that 'I am the little artist of the house'. Old kitchen trolleys or boxes can be used to store the art materials. Old hankies, bits of cloth -as big as a regular hanky or napkins, can be saved for wiping or cleaning brushes or come handy while painting. A lot of household items (unbreakable) can be also reused for small water containers or for paint palettes. Children also love sitting on the floor, so an old rug, a small easel, or board can be used. Toddlers need constant supervision to avoid mishaps. It always better to help them plan if they are unsure about activities to choose or help in cutting, suggest topics, remind them of an incident or a vacation incident. Its a pleasure to include a small sketch book and a small set of pencil, eraser and crayons while travelling or if you feel the doctor's visit could take longer on that particular day. Never pick up cheap sets of crayons, markers, color pencils, even pencils which look attractive and are usually poor in quality. Always pick up small sets of good quality material because children are always enthusiastic about using new ones and are happier to use things that work better! 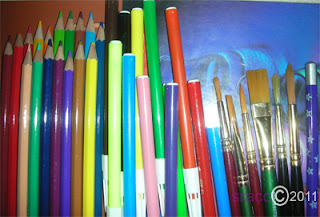 Drawing or sketch books with good number of pages or sets of sheets, pencils, crayons, color pencils, poster paints ( if the parent can help in arranging for mixing trays and supervise younger children), brushes, erasers, sharpeners and display folders to contain their works or even a regular folder to start with. Let them enjoy and have fun creating!